No RSVP necessary to get into this special party! On Saturday, May 19 and Sunday, May 20, the Milwaukee County Zoo hosts its annual Party for the Planet sponsored by American Transmission Co. (ATC). This one-of-a-kind conservation celebration combines education and fun, as visitors learn about the need to save the planet’s resources for future generations. We can all do our part to help the environment and the pollinators! Stop at the ATC table and play the Pollinator Wheel Game to learn more. See what you’d look like as a pollinator with ATC’s free photo op (photo will be texted to you!). Get your Grow Smart® planting guide, pollinator planting guide and Tall Tickseed seed packets to help attract pollinators! Help out in the Zoo’s Pollinator Garden with gardening expert Melinda Myers! Hop aboard our environmentally-friendly tram for a free conservation tour! Tickets available at the Meijer Zoomobile booth. Limited seating; weather permitting. Become a bird watcher and identify the different birds living around our scenic pond. The Wisconsin Arborist Association will lead a fun tree-climbing activity for the kiddos! The Zoo’s forest is home to animals like fox, red-tailed hawk and flying squirrel. Follow animal tracks to discover and identify the animals living in the woods. Learn about the effect that plastic waste has on our ocean and the animals who live there. Take the “Better Bag Challenge” and pledge to reduce your disposable plastic bag consumption by using recyclable bags. The first 200 people to take the pledge each day will receive a free reusable canvas tote bag! 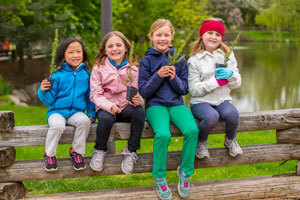 Pot a free evergreen sapling to take home to plant! Also learn about the emerald ash borer. (Supplies limited). The Zoo’s animal collection is at the heart of Party for the Planet and offers many opportunities to learn how we can protect Earth’s important species. Rhino zookeepers will discuss the animals in their care and the ways you can help to make sure their wild counterparts are here for future generations. Purchase paintings created by our rhino, Mimi, as part of the Zoo’s enrichment program, make a rhino mask and take a behind-the-scenes tour of the rhino stall from 11 a.m. to 3 p.m. (suggested donation: $2). Join us for these eco-friendly activities to learn how we can contribute to creating a healthier environment for all living things on the planet! 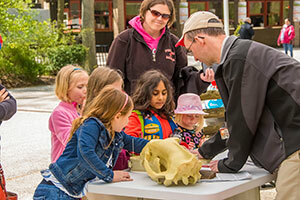 Party for the Planet activities are free with regular Zoo admission. For additional information, contact the Zoo’s Marketing and Communications Department at 414.771.3040.